With the season on the line and its best pitcher on the mound for the last game of his collegiate career, Joe Popielarczyk and the No. 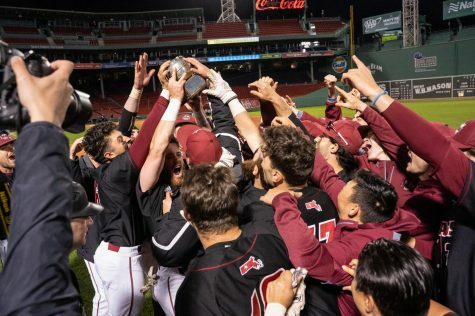 4-seeded Massachusetts baseball team faced elimination Thursday night in the Atlantic 10 tournament, but could not hold off a Rhode Island comeback when it mattered most. Having each lost earlier in the day, both teams were in a do-or-die situation, and it was the No. 3-seeded Rams (33-24) who delivered with a 6-5 victory in their first matchup of the year against the Minutemen (22-22). Statistically, it was the A-10 Pitcher of the Year’s toughest game of the season. Popielarczyk went into the game having given up a mere 11 earned runs in 79.2 innings pitched, but by the end of the night, that total had risen to 16. The five earned runs brought his league-best 1.24 ERA up to a mark of 1.66, which was still good for the A-10 lead by nearly a run. 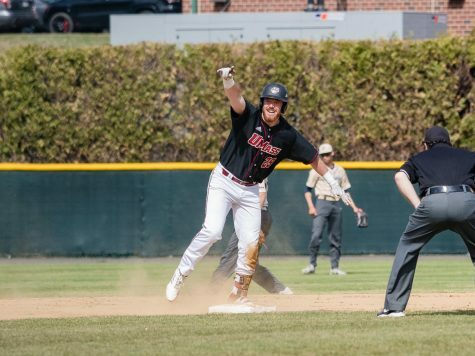 Rob McLam started at second base in place of Ryan Cusick and led off the game with a single, and eventually made his way around the bases and scored on the game’s first run on a wild pitch. McLam, who was last week’s A-10 Player of the Week, was key in getting the Minutemen into the tournament, as he went 7-for-11 at the plate in the most crucial series of the year against George Washington last week. 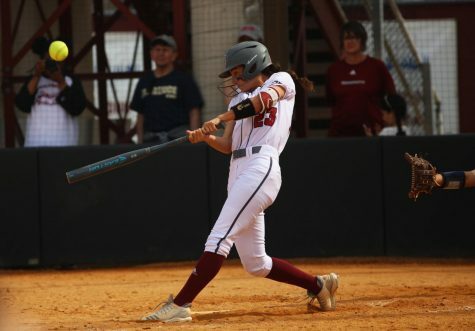 The sophomore also knocked in four runs and scored six times as UMass swept the Colonials and clinched the fourth seed for the championship. After retiring the side in the first, Popielarczyk ran into a jam in the second. After loading the bases with two outs, the senior gave up back-to-back doubles to Chris Famiglietti and Jeff Roy respectively. The doubles brought in four runs for URI as Popielarczyk’s earned run total surpassed his season-high of three set earlier in the year against Temple. The Minutemen came back strong in their next time at bat as they plated four of their own batters to regain a one-run lead. Kyle Adie started off the inning with a six-pitch walk, stole second and then took third base on the play when Rams catcher Milan Adams threw wildly into center field as he attempted to pick off the speedy sophomore. 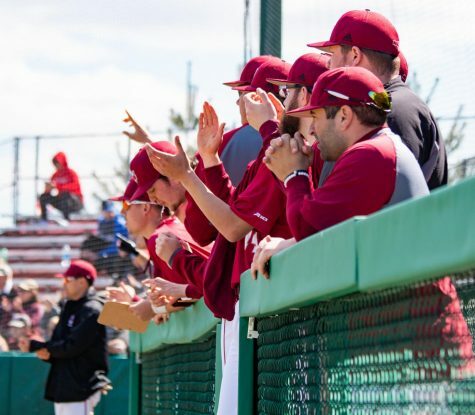 Anthony Serino scored Adie on a groundout, and Tom Conley, who went 3-for-3 in his final collegiate game, singled before Dylan Begin clocked his third home run of the year over the fence in left-center field. 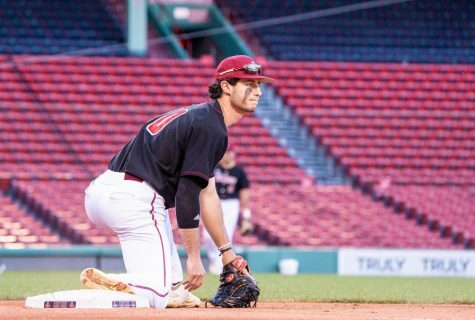 Nik Campero nearly mirrored Begin’s homer on the next pitch as he belted a double to the left-center field wall, and Alex Tuneski followed with an RBI single to left as UMass took a 5-4 lead. Popielarczyk settled down over the next five innings, as did the Rams’ pitching staff, which did not allow a run for the remainder of the game. But in the bottom of the eighth, URI laid a crushing blow on the Minutemen. 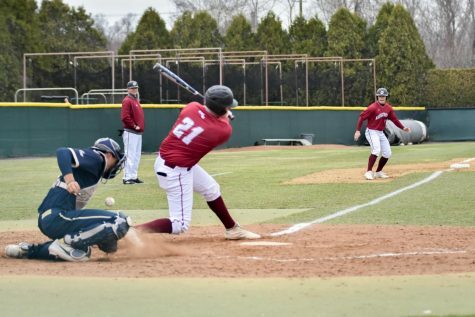 With one out, Adams reached first base on a throwing error by shortstop Nick Sanford, and third baseman Dan Haverstick then launched a 2-1 pitch over the left field fence, his second of the year, and the second surrendered by Popielarczyk on the season. 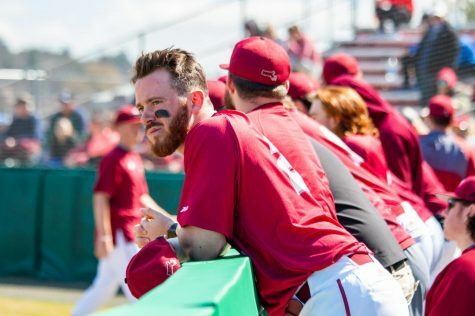 UMass threatened in the ninth with three hits, but failed to plate the tying run as the Rams edged by with the one-run triumph. On Friday morning, URI will play the loser of Thursday’s game between Dayton and Saint Joseph’s. 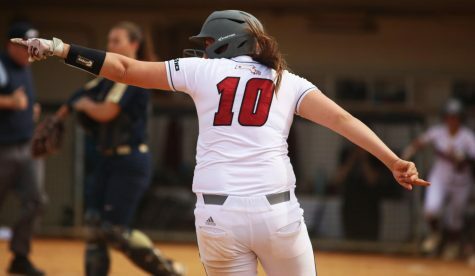 The most powerful team in the A-10 did not back down Wednesday afternoon as Richmond (28-24) faced UMass and launched its 57th, 58th, and 59th home runs of the season – 27 more than Dayton, which has the second-most homers in the conference. The top three home run hitters in the league, Chris Cowell, Jacob Mayers and Phil Ruzbarsky respectively, each came through with blasts for the Spiders on their way to a 9-5 victory in the opening game of the A-10 tournament. Richmond got under the skin of junior starter Dennis Torres right away, as the first three men to bat scored off of the right-hander. Matt Zink led off the game with a double and Torres hit the next batter which put Mayers in a prime position to deliver. The designated hitter lined the second pitch he saw over the left field fence for his 10th homer of the year, as the Spiders took an early 3-0 lead. In the bottom of the first, the Minutemen brought one across the plate when Adie doubled down the left field line and advanced home on a first-pitch single by Serino. UMass brought two more home with two outs in the third after McLam and Adie were issued back-to-back walks. Conley and Begin hit consecutive singles to bring in one run apiece, as the Minutemen tied the game at three. But it was the closest that the Minutemen would come to a lead in the game, as Richmond took off from there. In the fifth, the Spiders took Torres deep for the second time when Cowell crushed a two-run shot to left-center field, good for his 19th home run of the year. Richmond scored its sixth run of the game later in the inning when Ruzbarsky stole home as the Spiders successfully attempted a double steal. In the seventh, Ron Wallace relieved Torres with the hope to take the crack out of the Richmond bats, but the Spiders did not cease as Ruzbarsky ripped a 1-0 pitch well beyond the 400-foot marker in center for a 7-3 lead. 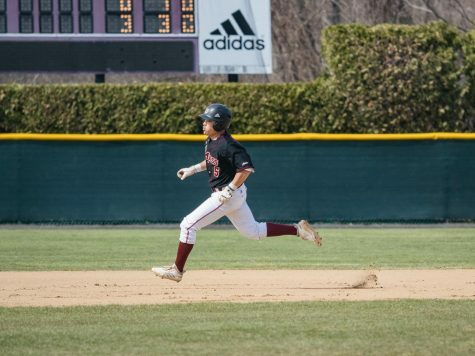 UMass etched a run back in the bottom of the seventh on another RBI single off the bat of Serino, and Richmond responded with two more runs in the eighth to take a commanding 9-4 advantage. 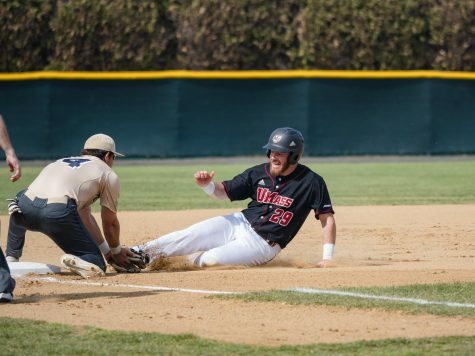 Three Minutemen reached in the bottom of the ninth, but only Rich Graef scored in the last-stitch effort as UMass took the defeat. In the quarterfinal game Thursday afternoon, Zak Sterling tossed a four-hit shutout for Richmond as Cowell belted his 20th home run of the year in a 6-0 upset over top-seeded Saint Louis. The Spiders will face the winner of the Dayton/Saint Joseph’s game on Friday in the A-10 semifinal. Taylor Snow can be reached at [email protected] and followed on Twitter at MDC_Snow.